Hashim Amla scored 196 and AB de Villiers 169 in a batting exhibition that drove South Africa to a commanding lead of 631 runs before they were dismissed for 569 on the third day of the third Test against Australia on Sunday. Ricky Ponting, playing his last match for Australia, has said that winning the 2003 World Cup in South Africa is among his proudest achievements. Ponting had hit a brilliant 140 in the final against India. The cancellation of the match between the Indian men and Afganistan on the inaugural day of the 3rd World Kabaddi Cup led to much disappointment amongst the fans. The World Kabaddi Cup got underway today, much to the joy of the spectators, with the state government making tall claims about taking kabaddi to the Olympics. India recovered from conceding an early self-goal to prevail 4-2 over New Zealand and move to the top of Pool A in the Champions Trophy hockey tournament here today. Opener Anamul Haque struck his maiden international century as Bangladesh crushed West Indies by 160 runs in the second One-day International on Sunday to record their biggest win in the 50-over format. Indian shotgun coach Marcello Dradi has said that he should be blamed for the poor show of the country’s shotgun shooters at the London Olympics. He said the shooters, who “were under a lot of media attention”, can’t be blamed. They dealt with spin quite well in the series-levelling win in the second Test but the visiting England cricket team's batsmen continued to practice against tweakers ahead of the third Test against India starting here on December 5. Two local club spinners—one left-arm orthodox and another leg-spinner—along with Monty Panesar bowled at the nets in tandem. High on confidence having levelled the four-Test series 1-1 against India, England middle order batsman Jonny Bairstow said that his team would like to carry on the momentum and produce positive result in the third Test, starting here on December 5. "The confidence and morale of the side is obviously very high at the moment. Definitely it's an exciting time for us as a batting unit. Also the bowlers are doing so well, it's very pleasant for us and gives us the right confidence ahead of the third Test. After spending three years out of the England side the left-arm spinner sought psychological help and he is now reaping the benefits, writes Stephen Brenkley in Kolkata Before the ball of his life, Monty Panesar gave himself a good talking-to. Speedster Pankaj Singh put paid to Punjab’s hope of gaining first innings lead on Day Two as he blew away lower middle order with his five- wicket haul just when the hosts came tantalizingly close to 8 runs short of taking the crucial advantage on Day 2. Tripura posted a massive 441 in their first innings and then reduced Himachal Pradesh to 111 for five to give the visitors an overwhelming upper hand on the second day of Group C match. Having started the day on 325 for four, Tripura eventually folded for 440-plus runs. In reply, HP were struggling when the stumps were drawn with Aatish unbeaten on 28 and Rishi Dhawan batting on 16. Unmukt Chand's impressive half century was the lone bright spot in an otherwise dull day for Delhi as they were struggling 165/6 in reply to Haryana's decent first innings score of 307 in Group B match. The Pakistan Cricket Board (PCB) inspection team today gave a green signal to the Eden Gardens after inspecting the stadium and facilities here for Pakistan's One-dayer against India to be held on January 3. The third Kabaddi World Cup has already begun but the host nation, India, is yet to decide on who will be leading the women’s team. It is no surprise that the delay in naming the captain and the vice-captain is going to adversely affect the performance of local eves in the current edition. Australia were left needing to better the record for a successful fourth-innings chase by 213 runs to record an improbable win or bat for two more days to force a draw and save the series. The hosts had eaten into their target to the tune of 40 runs without loss by the close of play with openers David Warner (29) and Ed Cowan (nine) having survived a sometimes nervous last hour. After the first two tests in Brisbane and Adelaide ended in draws, South Africa only needed a third in Ricky Ponting’s last Test to ensure they remained the world’s number one side. They will now be expected to do considerably better than that and become the first team since the West Indies in the 1980s and early 1990s to win consecutive series in Australia. De Villiers said the Proteas were taking nothing for granted, however. “We know we have a lot of hard work to do tomorrow, it’s a good wicket. If the Test match goes the full length, they will come close,” he told reporters. “We are not arrogant in any way whatsoever. It won’t be easy. We know the Australian batsmen are dangerous players and won’t be giving it away.” Amla’s brilliant innings was one for the purists, while de Villiers started slowly before accelerating after he reached his fifty to bludgeon the Australian bowlers with every shot in the book. Picking up where he left off on Saturday when he helped the tourists plunder 206 runs in the extended third session, Amla got the single he needed to reach his 18th Test century from the third delivery of the day. Peppering his innings with some sublime cover drives for a good few of his 21 boundaries, Amla’s comfort at the crease had echoes of his unbeaten 311 against England at the Oval in July. Australia’s pace unit, acclaimed after ending South Africa’s first innings for 225, toiled in the sunshine looking for a breakthrough but their best efforts only slowed the flow of runs. It took a brilliant catch from Mitchell Johnson off his own bowling to dislodge Amla shortly before tea as the 29-year-old was approaching a double century after 350 minutes and 221 balls. Johnson (4-110) found a little bit of extra pep with the new kookaburra and when the South African drove the ball back at him, he snatched it out of the air for a second superb caught and bowled of the innings. Dean Elgar was despatched lbw by Johnson four balls later for a pair of ducks on his debut but the day already belonged to South Africa’s batsmen. De Villiers had moved reasonably cautiously to his 50, with the exception of one huge six off spinner Nathan Lyon that hit the second deck of the stand at long on. He upped the pace with a string of quickfire boundaries to reach 89, then graduated to his 14th Test century in stunning style with three successive reverse sweeps for four, again off Lyon. Faf du Plessis (27) and Robbie Peterson, who failed to score, came and went before Johnson’s fellow left-armer Mitchell Starc (6-154) finally removed de Villiers caught behind. The 28-year-old was clearly furious with himself for having fallen short of the double century after his innings of 169 off 184 balls with 21 fours and a trio of sixes. Ponting had earlier bowled one last Test match over at the cost of three runs to huge applause from the 13,000 crowd at the WACA, but the chance of finishing his career with a victory was surely gone. The 418 scored by West Indies against Australia in 2003 was the highest successful fourth innings run chase in Test cricket, while South Africa scored 414 to win the corresponding Test at the WACA four years ago. “It’s just batting session by session. We’ve got to believe we can do it,” said Australia coach Mickey Arthur, who was in charge of South Africa in that 2008 Test. “Looking back that was a very proud moment in my career as a captain and as a player to be able to stand up on the big stage and I guess as a player that’s been around a long time, they are the games you want to stand up in,” he said. The lack of enthusiasm was clearly visible as the viewers started leaving the stadium as soon as the news spread that the Indian team would not be in action today. By the time the first match, between England and Denmark, was over, half the audience had already left. In the inaugural match, the experienced England players outclassed their opponents with a huge margin of 58-25. For the initial few minutes, the England players controlled the game completely and did not give any opportunity to their opponents to score but the Denmark players started gaining momentum and managed to cut the lead to 14-25 by half time. But it was too late to catch up with England, whose raiders and catchers seemed in great form. Denmark could score only 11 points in the second half as compared to England’s 33. The second half of the match between Denmark and England was halted for about 15 minutes due to a power failure. The cops and organisers had to arrange emergency lights. The match was started after power was restored. In the second match, of the day, Norway defeated New Zealand with a total of 52 against 35 points. World Cup silver medalist archer Gagandeep Kaur, gymnast Meenakshi, boxer Kanwarpreet Beniwal and boxing coach Harpreet Singh were also honoured. It’s ironic, thus, that the Punjab Kabaddi Association rejected the request from the Malaysian male kabaddi team to participate in the tournament, while their female counterparts have been included. Association President Sikander Singh Maluka, Punjab Education Minister, has cited resources constraint as the reason behind rejecting this request. Documents available with The Tribune show that the players from Baba Deep Singh Kabaddi Cup, Malaysia, had sent a letter to the Punjab Sports Department on July 26, 2012, requesting them to enter their team in the tournament but received no reply. Speaking to The Tribune from Malaysia, the players said that despite repeated emails and phone calls to the Sports Department, they were not given any suitable reply following which they directly communicated with Maluka. “He said we were not being allowed in since we were not very good in the game,” said a player, Harvail Singh. “We’re much better than most of the nations that are competing” he added. Maluka said they have not been allowed de to resources constraints. “Many nations have started playing kabaddi but we cannot entertain all as we have to consider our constraints. Therefore, we decided to select those nations that are known for kabaddi and are good,” he added. The victory gave India six points from two matches, making them the only unbeaten team in the pool following England’s surprise 4-1 win over Olympic champions Germany earlier in the day. New Zealand took the initial lead in the third minute when India conceded a self-goal, which has been introduced into world level hockey after the Olympic Games. Rupinderpal Singh failed to cleanly stop Sardar Singh’s back-pass in front of the goal and the ball trickled over the goal-line to concede India’s first self-goal in international hockey. New Zealand defence also wilted under pressure to give India the equaliser through a self-goal. Akashdeep Singh dived for a deflection on Sardar long through ball, which went into the goal off a defender to give India the equaliser in the 10th minute. A fine field goal by Gurwinder Singh Chandi (14th) and a penalty corner conversion by V R Raghunath (25th) gave India a 3-1 lead at the interval before New Zealand came back through a flash strike by Nicholas Wilson two minutes into the second half. Mounting pressure through repeated raids, India put the game out of New Zealand’s reach when Danish Mujtaba capitalised on a rebound from the goalkeeper on a pressing move in the 65th minute. Playing only his second one dayer, right-handed batsman Anamul smashed 120 off 145 balls to help Bangladesh post 292-6 before the hosts skittled out West Indies for 132 for a comprehensive win that put them 2-0 up in the five-match series. Dradi is hopeful of more shooting medals for India in the future and says that the next two years are crucial. Before the Olympics, Dradi had said several times that he “would not be satisfied” if the shotgun shooters finished poorly in London. “I lead from the front and when the shooters do well, it is their hard work but their failure is mine,” he said. Dradi said that the shooting scenario has changed and there is too much media glare on the shooters. “I have told the core group of Indian shooters to relax and concentrate harder after the new rules come into play, from next year,” he said. “The shooters have to relax — the word relax here means relaxing in terms of medals and take a medal break. For example, Ronjan Sodhi won so many medals in the past three years and was considered a big hope. When a big hope is dashed, there is talk. We all need time to settle down, shooters are no different,” Dradi told The Tribune. India have not done too well in the ongoing championship, with the lone medal being bagged by RVS Rathore yesterday. They dealt with spin quite well in the series-levelling win in the second Test but the visiting England cricket team's batsmen continued to practice against tweakers ahead of the third Test against India starting here on December 5. Two local club spinners—one left-arm orthodox and another leg-spinner—along with Monty Panesar bowled at the nets in tandem. Monty, particularly, bowled his heart out as the English cricketers tried to master orthodox spin. arlier, the English cricketers arrived in two batches with Kevin Pietersen arriving in the afternoon. Skipper Alastair Cook was seen deeply involved in a discussion with bowling coach Mushtaq Ahmed. The in-form Cook, who has two centuries from two Tests, was seen negotiating the throw-ins from the former Pakistani leg-spinner and later the duo engaged themselves in discussion, while the remaining English players practised in the two practice nets.Batsman Jonny Bairstow later acknowledged that the team still has challenges left to deal with despite dominating the Indian spin trio of Harbhajan Singh, Pragyan Ojha and R Ashwin in the Wankhede Test. "It's still going to be tough. There will always be challenges left in the spin department. With the weather conditions and with the reverse swing, it would be a massive challenge for us. But we will be looking forward to dealing with that in the next Test," Bairstow conceded. As they practised in tandem, a few yards away, the wicket lay covered. "Honestly, we did not have a look at it. That's not something we do normally before the match. I'm sure the Indians have had a detailed look and take the right decision," he said. in The Peak - a book by sports photo-journalist Suman Chattopadhyay which was launched by cricketer Yuvraj Singh at a glittering ceremony in Kolkata on Sunday. The book captures some rare and memorable moments of Tendulkar's life through Chattopadhyay's lens and the stories behind them in the master's own words. "I was spending some time with my children in a swimming pool when I saw some movement behind the curtains upstairs and heard camera clicks. I did not have to guess as he could be none other than Suman," said Tendulkar talking about a snap that finds a proud place in the book. "Suman is among those few persons who have seen me from close quarters since my early days. I happen to carry a photograph taken by him, wherever I travel," added Tendulkar. The photograph is of a young Tendulkar lying on the lap of his parents and adorns the cover of the book. The peak has been scripted by journalist Sunandan Lele and has a foreword by former cricketer Anil Kumble recapitulating his long association with Tendulkar. It also has special quotes by cricket legends Sunil Gavaskar and Kapil Dev as also iconic singer Asha Bhosle. "As a kid I always looked up to Sachin and still continue to do so. He is my hero... he is the nation's hero," said Yuvraj at the launch of a book on Tendulkar Sunday. High on confidence having levelled the four-Test series 1-1 against India, England middle order batsman Jonny Bairstow said that his team would like to carry on the momentum and produce positive result in the third Test, starting here on December 5. "The confidence and morale of the side is obviously very high at the moment. Definitely it's an exciting time for us as a batting unit. Also the bowlers are doing so well, it's very pleasant for us and gives us the right confidence ahead of the third Test. We have had a nice week off after the Mumbai Test and have recharged our batteries. Now looking forward to the third Test. Hopefully we can push forward," said Bairstow after the visiting team's first training session at the Eden Garden. The 23-year-old said they would approach the remaining two Tests (at Kolkata and Nagpur, respectively) in a positive frame of mind and there would not be any massive changes. “We will obviously go the same way as in the first two Tests. We will be preparing the same way as we did in the first two Tests," said Bairstow. "Obviously, we have got some confidence from the Test at Wankhede and will be looking to take that into the remaining two Tests. Hopefully, we will come out with a positive result," he added. Talking about the splendid form of Kevin Pietersen and skipper Alastair Cook, Bairstow said that their performances would inspire others also to do well. "They played outstandingly well and Cook has played brilliantly in both the Tests. Kevin played the way he does in Mumbai. It was pleasure to watch those two innings. I'm sure the guys would take the snippets out of their games and improve themselves. 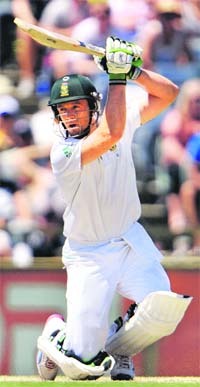 Our batting unit has improved from the past," said the batsman. Bairstow had scored fine 95 and 54 in both the innings at Lords's against South Africa but only to be dropped thereafter. "Obviously, it was disappointing. But the decision was taken for keeping the balance of the side. But I kept working hard at the nets and got a call for the second Test at the Wankhede. "It's something which is not in my hands. I can't have any say on these decisions. Obviously, I'll be delighted to be selected. I'm just working hard at the training," he said. He had just bowled too short to Sachin Tendulkar, but it went on with the arm a bit and he escaped punishment. Two balls earlier in the over it had not turned out so well. A leg-stump full toss had been nonchalantly dismissed through midwicket for four. Things needed to change quickly, and Monty knew it. "All of these things were on a checklist in my mind, I was ticking them off. It was like I was doing a service on me, like an MOT. Then I get that right and the timing obviously clicked." What happened after this bizarre unseen ritual on the first morning of the Second Test in Mumbai was the perfect left-arm spinner's delivery. It fizzed through the air and bent towards leg stump. Tendulkar, groping forward, was powerless as the ball pitched, turned acutely and smashed unceremoniously into his off stump. Tendulkar is 39 now and in the death throes of a marvellous career but that ball would have bowled him when he was 29, 19 and nine. It left India in serious trouble at 61 for 3, and though they partially recovered, they lost the match by 10 wickets. The victory was greeted rightly as one of England's most precious and it is 1-1 in the series going into the third match of four on Wednesday. There were 10 more wickets for Panesar in Mumbai, including that of Tendulkar a second time and for the fourth in all Tests. His figures of 11 for 210 were a career best, but it is that solitary ball that will endure as an image in the mind. "It was probably one of my best balls, it even caught me by surprise," said Panesar, reflecting on it a few days after the victory. "The conditions helped because it was a used wicket, and when you're bowling at that pace there's a slight chance for it to grip. But if it was a flatter deck it probably would have skidded on." But it said something, too, about the bowler, maybe the man that Panesar has become. That swift analysis of what he must and must not do as he went back to his mark for the fifth ball of the 19th over was the upshot of another kind of analysis. It was a see-saw battle throughout the day between defending champions Rajasthan and resurgent hosts, which finally ended in favour of visiting side after comeback man Ravi Inder Singh (85) and Gurkeerat Mann (40) prolonged stay at the crease kept tilting the scales in middle overs. At the end of the day, Rajasthan bundled out Punjab for 215 and then put up 56/1 on board to offer a hosts of possiblities for next two days. For Punjab, the only solace came in from Baltej Singh’s who dismissed Dishant Yagnink (32) at the fag end. Vineet Saxena (16) and Deepak Chahar (7) not only ensured that there was no further loss, they ensured Rajasthan has much to play for in next two days. While the hosts have rested some of the key players, a depleted Rajasthan has been battling with injuries to key players. Tripura posted a massive 441 in their first innings and then reduced Himachal Pradesh to 111 for five to give the visitors an overwhelming upper hand on the second day of Group C match. Having started the day on 325 for four, Tripura eventually folded for 440-plus runs. In reply, HP were struggling when the stumps were drawn with Aatish unbeaten on 28 and Rishi Dhawan batting on 16. Although Tripura`s Ajay Ratra and Abhijit Dey fell early on the day, Manisankar Murasingh (29), Tushar Saha (28) and Rana Dutta (20) chipped in valuable runs to take the team`s total past 400-run mark. For HP, Rishi finished with 4/114 as HP got off to a poor start. Delhi still need 143 runs to get the first innings lead and has very little support with Sumit Narwal being dismissed off the last ball of the second day bowled by Haryana skipper Amit Mishra. 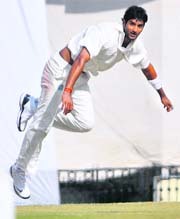 Mishra has taken two wickets while medium pacer Harshal Patel has also taken a couple of wickets. Unmukt hit eight fours and two sixes but didn't get much support with senior pros Rajat Bhatia (21) and Mithun Manhas (20) even after spending considerable time. Happy with the facilities, PCB media manager Nadeem Sarwar said: "We are very happy with the arrangements. We spoke the the commissioner of police (R K Pachnanda) in the morning and he has assured me of a smooth conduct. "It's a peaceful place. I don't think there will be any trouble. Sarwar led a four-member team, consisting of Ehsan Sadiq, Sohail Khan, Usman Wahla to the inspect the venue. Ten former Pakistani greats will arrive in India to witness the two Twenty20 Internationals and three-ODI series beginning on December 25 (Bangalore T20I) against India. Sarwar said two former Pakistan cricketers will go to each venue but they were yet to prepare the list. The inspection team had first went to the police headquarters at the Lal Bazar before inspecting the Eden Gardens that will host the second ODI. The Pakistan Cricket Board has laid some strict guidelines for its players for the upcoming tour of India which includes restrictions on attending private dinner parties and not entertaining any friends at the team hotel. "There are certain security protocols that we have taken. The players won't entertain any requests from friends or fans to attend private dinner parties. They have also been intimated that they can't entertain any guests in their hotel rooms," PCB spokesperson and GM (Media affairs) Nadeem Sarwar said. No wonder the aspirants for the coveted post are keenly awaiting the announcement. The travails of women’s team are unending. They had to undergo harrowing time as they were accommodated at the last minute during the conditioning camp. The trials for the final squad have been rescheduled time and again. When asked about the delay in the selection of captain, the Indian coach Palwinder Kaur said, "National Anti-Doping Agency (NADA) had conducted dope test of women players a few days ago. We are waiting for the result of dope test, which are expected to declare on Monday. After the outcome of dope results we will announce the captain on the basis of merit". "The decision to declare the captain was put on hold to avoid the controversy. If the captain of team is declared positive in dope test it will affect the morale the team" she added. It is pertinent to mention here that eight women players in the Indian contingent are trainees from a coaching academy located at Nawanshahr. The captain and vice captain are expected to be one of these trainees. In the last edition, Priyanka and Jatinder Kaur from the same academy led the Indian team to victory. Meanwhile, players form the England women’s team enjoyed the day by shopping traditional attires in the city markets. Gurgaon: Thailand’s Pornanong Phatlum presented herself an early birthday present by winning the Hero Women’s Indian Open for a record third time while 14-year-old amateur Aditi Ashok was the best placed Indian with a tied eighth-place finish. Phatlum, who celebrates her 23rd birthday on Tuesday, carded a final round of six-under 66 to set a new tournament record of 13-under 203. Aditi Ashok was the best from the host country with rounds of 69, 74 and 72. Pune: Luka Kipkemoi Chelimo of Kenya won the gruelling 42.195 km men’s race in the 27th edition of Pune International Marathon here today. Luka set a new course record of 2 hours, 13:03 minutes to win ahead of compatriot Simon Kiprugut Kirui. Kenya also swept the women’s 21 km race by sweeping the first three places. Kumulu Pauline Kaveke set a new course record of 1:08:37. Kavita Raut brought some cheers in the Indian camp by bagging the 10th place in the women’s event with a time of 1:17:39.